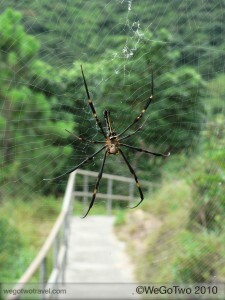 I have been taking to the hiking trails of Lantau Island over the past week. The weather is hot and humid and this makes for some sweaty hiking. However, the views are excellent and the flora and fauna is something to see. These small and colourful insects, called ‘banana spiders” here in Hong Kong, suspend their webs over the hiking trails so you have to keep a good lookout for them. There are hundreds, if not thousands, of them out at this time of the year and they make great photographic subjects. This entry was posted on Wednesday, July 14th, 2010 at 4:34 pm	and is filed under Hong Kong. You can follow any responses to this entry through the RSS 2.0 feed. You can leave a response, or trackback from your own site.